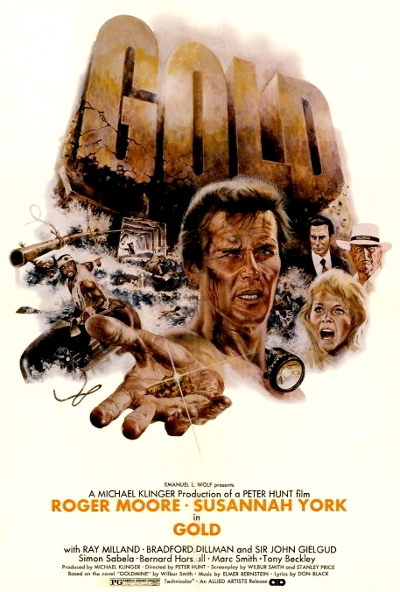 Gold, a romantic/adventure/thriller/disaster film (based on a novel by Wilbur Smith) was the first picture Roger Moore starred in outside of the Bond franchise after making his superspy bow in Live and Let Die. Some old hands from the Bond stable were onboard to lend their experience to Gold. Peter Hunt (director of On Her Majesty's Secret Service) helms while Maurice Binder adds a very Bondesque title sequence. John Glen, who served as editor, second-unit director and full-fledged director during his long association with the Bond series, supervised some of the mine flooding sequences in Gold. Gold is one of the best films Roger featured in outside of the Bond franchise and some notable veterans were roped into proceedings with John Gielgud and Ray Milland taking supporting roles. Susannah York is the love interest for Rog while Bradford Dillman and Tony Beckley are wonderfully nasty as the villains. The acclaimed composer Elmer Bernstein scored Gold and earned an Oscar nomination with Don Black for the song Wherever Love Takes Me. The film, somewhat controversially, was made in South Africa although some of the mine sequences were created using sets at Pinewood. 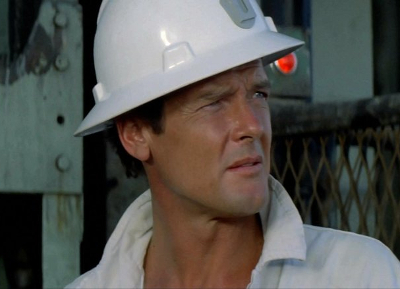 In Gold, Roger plays Rod Slater, the general supervisor of a South African gold mine who is used as a pawn in a conspiracy to destroy the mine to increase the value of gold stocks. Until of course he rumbles the plan and tries to thwart it. A crooked high powered syndicate is behind the scheme and partly led by the director of the mine operation Manfred Steyner (Bradford Dillman). Steyner is keeping this a secret from his wife Terry (Susannah York) and her father Hurry (Ray Milland) - the man who owns the mine. Slater, who Steyner hired, is to be duped into sabotaging the mine by opening an underground quarry which - unknown to him - will flood the mine and raise the value of the gold stocks for the businessman crooks behind the caper. Sounds like the plot of a James Bond film! When Slater begins an affair with Terry (strange name for a woman! ), Steyner sees this as a way to keep Slater distracted and also make his revenge on his wife's family (by destroying their business interests) all the sweeter. Gold is a solid entry in the Roger Moore sweepstakes and enjoyably dated in the way that seventies films unavoidably tend to be to modern eyes. It's all part of the charm now. Lots of oversized ties and people in boardrooms with cigars. Roger has a huge tie in one scene that almost blocks out his shirt. Although Roger Moore was often criticised for being too laid-back as an actor, Gold finds him admirably engaged as the hot-headed Slater. He says "What the hell!" a lot when informed of fresh mining palava and also stands up for the discriminated miners. A black miner in Apartheid South Africa. Wow, I bet that was a fun job. Roger also turns smoothie to romance Susannah York. This part of the film is the most obvious in Gold reminding the audience that their lead is now James Bond. Gold has a snazzy opening with the Binder titles (all bold letters and gold/mine themed bric a brac before a cityscape) and the score by Elmer Bernstein is great stirring stuff. Gold makes excellent use of the South African locations too with some sweeping aeriel views of landscapes and forests and the mine sequences feel authentic and are competently handled by Hunt and his crew. The film doesn't have the sweep and elegance of On Her Majesty's Secret Service but then the budget was probably nowhere near the one Hunt had on that film. On this evidence Hunt would have been perfectly capable of directing one of the Roger Bond pictures and getting a slightly more hard edged than usual performance out of him. It's all rather predictable but the conspiracy is fun with Bradford Dillman as the slimeball baddie and Ray Milland the cranky but essentially decent mine owner. John Gielgud could play his part as the scheming Farrell in his sleep but he lends some gravitas and class to the film. Susannah York isn't terribly stretched by her role as Dillman's bored, unfufilled wife but she has a decent rapport with Roger and as far as acting chops go is better than many of the Bond actresses he shared the screen with in his day job. For some reason Gold has been somewhat forgotten these days (I'm sure I read somewhere that Roger fell out with the producers and so didn't look back on it with tremendously fond memories) but it's a perfectly watchable and well made adventure film with elements of conspiracy and romance. Certainly one of the better films in the long career of Sir Roger.